What makes this creamy casserole crowd pleasing? We think it has something to do with the ham, broccoli and cheddar. Probably the crouton topping, too. 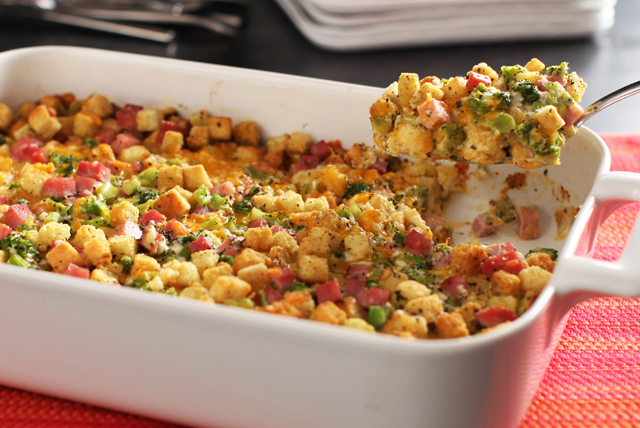 Combine ham, broccoli, cheese and croutons; place in 13x9-inch baking dish sprayed with cooking spray. Whisk eggs and milk in medium bowl until blended. Add remaining ingredients; mix well. Pour over ham mixture. Refrigerate 1 hour. Heat oven to 375°F. Bake casserole, uncovered, 45 min. or until center is set. This is a great way to use leftover baked ham.